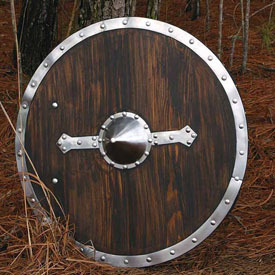 This finished shield has been pre-stained a dark brown and has a steel boss, decorative strips and rim, all bolted on. The back is covered in felt and has a grip and arm strap. Overall: 29" x 1/2" thick.